Hi everyone! Lisa here with you today to share some layouts I made with the new Homespun and DIY Boutique collections. First up is a sweet page about my daughter and her fur baby. I worked in pieces from the Sn@p Cat collection since we all know cats think the world revolves around them. :) I used some of the decorative brads like flair (house, heart and flowers) by cutting the prongs off the back and adding dimensional foam to the back to make the pieces pop off the page. This second page is based on a wonderful sketch by Becky Fleck. The Simple Stories team partnered with PageMaps this month. Be sure to pop over to the PageMaps web site to see all of the fabulous sketch-inspired projects. Are any of you So You Think You Can Dance fans? My daughter is, so imagine her excitement when she had the chance to dance with tWitch at a recent dance convention. Every time I see this photo of the two of them together, it brings a smile to my face. The fun and happy colors of the DIY Boutique collection totally captured my daughter's excitement and worked perfectly with the photo. I pretty much followed Becky's sketch, adding in my own touches and style, with a lot of layering and embellishments. This is a detail shot of the top right corner. I hope you've enjoyed getting a look at Homespun and DIY Boutique in action and you're inspired to add these collections to your own stash. Have a great day! "I love this card because I happen to be drawn to travel lines. I thought the combination of the map background with the pretty script font was interesting. Plus, this card could be used for a few different themes, not just travel, which makes it both cute and versatile"! "This is one of my favorite cards because the saying is SO true. I treasure all of my friends, though they have thinned out over the years, the ones that have stuck around through thick and thin are TRUE friends and I feel very lucky & blessed to have them in my life". "I love it because it's a new twist on making a list for your journaling. Pie charts are still oh so trendy and I love that you can add elements of your day, your trip, or whatever moments or events you are documenting in or around each section of the pie chart and journal about that part of the moment in the color coordinated lines below. How cool is that?!?! I love it and am using it the next time I sit down at my craft table"! "As a cardmaker, anything that makes my life easier is a big plus. I just love all the cards in the SN@P! Baby Girl pack, but this "Love You to the Moon and Back" card is extra special. It has a cute graphic design and a great sentiment all rolled into one. I know that I can add a card stock mat, a few stickers and some ribbon and end up with a really special card in no time flat". "As a cat lover I laughed when I saw this and remembered a trip my husband and I took last summer. This older gentleman was on a motorized bicycle and his cat was sitting on his lap. As he crossed the busy street he said " Hold On Mr. Whiskers" and of course hubby and I thought it was the cutest and funniest thing ever. We could just imagine the chaos our cat Eddie would cause if we tried this with him! This card makes me smile ;-) ". OK, now to more good stuff. At the beginning of this post I mentioned something about a giveaway! Enter via the Rafflecopter widget below by end of day Thursday, March 6th telling me which of our 6 cards is your favorite and why. On Friday I'll draw one random lucky winner to win not only the cards we selected, but the rest of the cards that are included with each package the cards are from - that's all of these fabulous Simple Stories cards that you see below, people! Kim here coming back at you with a few more cards. This time, I am working with the 4 X 6 SN@P! Baby Cards. At the risk of sounding really cliche, using this amazing product makes card making a...snap! (Hee, hee, couldn't resist that one). I literally used the entire SN@P! Baby Girl Card for the body of my Love You a Ton Card. I added an additional sticker, one brad from the DIY Boutique Collection and a bit of pink twine. The rounded edges on the bottom of the card add some extra softness. My Sweet Baby Love Card features a SN@P! Card trimmed down about an inch. The hearts on the top edge are Side B of this card. Love that the "B" sides automatically coordinate with the front, it sure makes life easy. I also added a few stickers grounded with a label from the DIY Boutique Collection. And, lastly (my favorite) the Oh Baby! Card. This card features a sweet little cluster of accents in the upper left corner that add just the right amount of polish to this already adorable SN@P! Baby Card. I really enjoy adding bits and pieces to my cards, so it's pretty clear that the DIY Boutique Collection will be one of my favorites. Thanks for taking a peek at my baby cards! Now that you see just how easy they are, why not create a few for your stash? Hello, Simple Stories fans! Melissa here to share another week in my Life Documented album as I continue on with catching up some weeks from previous years that are still left to scrap. This week finds the Homespun collection being used to document some Independence Day fun! Last time I hosted the blog, you may recall that I talked about using non-seasonal collections to scrap seasonal events, and I'm doing the same thing with this layout. Homespun isn't a 4th of July themed collection, but the family motifs and home-y accents definitely work for all of the bold colors in my photos of hanging out with my family and watching fireworks. I tweaked a few of the products here and there to make it all come together, and I'll share a few of those techniques with you below. If you haven't tried the new DIY (Design It Yourself) collection yet, you really need to check these pieces out! I used a DIY speech bubble die-cut as a layer under a chipboard camera from Homespun, and there are lots of great neutral layers in DIY that will coordinate with any of Simple Stories' collections! This red-bordered journaling card was actually pre-printed for Thursday, but since I needed a Tuesday card (and the Tuesday card in the collection didn't jive with my layout's color balance), I found a die-cut in the Bits & Pieces pack and layered it with a sticker to help the card fit my layout. A pre-printed 4x6 card can help build the fastest embellishment cluster ever! The doilies and banners were already printed on this card, and I simply added a tiny chipboard heart and a word sticker to both help tie the photo to the design as well as create a dimensional cluser in no time flat. Simple Stories' Insta-Squares make fabulous embellishents on Life Documented pages, even if you don't use the square Pocket Pages. Here I tucked a 2x2 heart card from the Homespun Insta-squares behind a small photo and layered on a die cut from the Bits & Pieces pack to finish it off. Quick, easy, and cute! As I close out my 2011 and 2013 Life Documented albums, I'm using the 12x12 faux leather Sn@p in teal to hold my layouts. These albums are simply gorgeous and have such a luxurious feel to them! All of my weekly Life Documented pages for 2011, 2012, and 2013 use Design 3 Pocket Pages- I'm so used to using this design that I totally get into a zone when choosing photo sizes to print, and it goes super fast! Editing and printing photos is my biggest hangup when it comes to any variety of scrapbooking, so I'm all for anything that simplifies the process. Today brings you the first of our new eBooks - the Homespun Simple Inspiration eBook - 16 pages of amazing inspiration; simply click on the link below to download & enjoy! Howdy! Layle here today to share some great news - we have 30 brand new cut file designs, now available for the Silhouette! Hi everyone! Teri here today, and I'm here with another Life Documented project. I'm excited to share with you a few pages I made with the SN@P! Summer set. I went to California last month and extended my trip by a couple days so I could go to Disneyland. What can I say? I'm a big kid, and I love going to the park. Lucky for me that one of my friends extended her trip as well so we were able to enjoy a couple days at the amusement park together. Sure, the adventure was in January. But I thought the happy colors of the SN@P! Summer set made it perfect for documenting the fun time we had. I mean, we are talking Disneyland! Hello, bright and happy colors! One of my favorite things on the left page is "This is Awesome" cut-out. That's a cut file from Simple Stories that's available in the Silhouette Online Store. I simply cut it from cardstock and then adhered it to a 3x4 SN@P! card. To give it some extra pop, I used my trusty sewing machine to stitch a line over the "awesome" word. The card next to it had a summer saying on it. That wasn't going to work for my page so I covered it up with a kraft rectangle from Simple Stories' DIY collection and added a new title to it. I really love that you can change up the SN@P! cards and make them your own. I added a tape sticker (yep, from the SN@P! Summer set) to the top of orange card at the bottom of the page. I went to town with customizing the cards on the right page, too. I covered up some words on the bottom card with a strip of cardstock and added some stickers to it so it would say "the good times." The polka dot SN@P! card on this page was so fun to customize! I added the picture and then embellished it with a overlay, a couple stickers and another phrase cut with Simple Stories' Check This Out cut file, also available in the Silhouette Online Store. I'm using a 12x12 SN@P! faux leather album in red to document my activities in 2014. I love that the album's ring binding allows me to scrapbook out of order. Sometimes, I wait to record memories until months after they've happened. And sometimes I like to scrapbook them right away. I like the freedom it gives me as a memory keeper. I used the SN@P! 12x12 Pocket Pages Design 3 for these pages. I like that these pages have a little extra room so you can embellish the cards that go into the pockets. It's nice to be able to add lots of layers if you want to. Thanks for stopping by today! I'll be back again soon! I am a twenty three year old new Mum from Tasmania, Australia. I began scrapbooking back in 2004 when I was just a teenager. I was never really a crafty person up until then but found love in the fact that I could tell a story through this craft. I dabbled in many mediums of scrapbooking over the years and was lucky enough to work on several design teams and up until most recently owned my own online scrapbooking kit club which I have since changed hands to focus on my new little family with the addition of our first child Elijah Mason who is just 2 weeks old. I love finding new products, techniques and ideas to focus on and this year I am excited to be combining my usual 12x12 style with some Pocket Page themed pages. I was so excited and nervous about being a new Mum and the scrapbooker in me just knew that I had to document it. I loved that with the SN@P! Binders you can set it up and work on little bits here and there. Throughout the pregnancy I just completed cards as I thought of them and slipped them in the pockets. I used the chipboard dividers that came with the album to section off the binder into three parts, one for each of the trimesters of pregnancy. I used some of the 6x8 inserts to document some of the bigger things and placed some of the ultrasound photos on these. I loved that Simple Stories SN@P! Binders have such a large variety of different sized inserts to accommodate different sizes. I used a mixture of 3x4, 4x6 and 4x4 sized pockets. It’s great for keeping things interesting throughout the album as not every layout is the same! I have shared pictures here of the first two sections of my album as the third section I was waiting on baby photos from the much awaited arrival of our son who is just two weeks old now. I can’t wait to share the completed album on my blog very soon! Isn't that an amazing keepsake Kayla created documenting her pregnancy?! I'm sure her son Elijah will treasure this album in the years to come. Congratulations Kayla on the birth of your son and thank you so much for sharing your amazing project with us this month! Hello! Nichol here today with some tips and tricks on utilizing 3x4 (or 4x6) Sn@p! Sets cards for die cutting. Whether you use a digital die cutting machine like the Silhouette Cameo or a manual die cutting machine, I've got some ideas on making the most of your Sn@p! products in non-traditional ways! 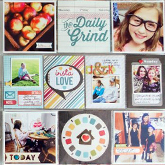 Digital die cutting completely changed the way I scrapbook and I can't imagine being without my Silhouette Cameo! And the icing on the cake? Why, the fact that Simple Stories now offers cut files in the Silhouette Store, of course! I used the following cut files for my first project share today, a layout utilizing eight different designs! I used some of the cut files "as is" and some files I altered to fit my layout needs. I'll show you how in the accompanying video. I used the polaroid die cuts to "frame up" my page, with a title and journaling in the center of my layout. By layering the die cut polaroids with Sn@p! 3x4 Cards, I was able to create a cohesive page with simple layers and lots of color. Once the base of the layout is together, layering on stickers, additional die cuts and dimensional embellishments make the page pop! The polaroid frames were cut using a variety of 3x4 Sn@p! cards. Most of the cards are from the awesome Office Card Foundations. I implemented many of the Wedding Sn@p! Squares and Pieces, Love Sn@p! 3x4 Cards and Homespun Squares & Pieces into the frames. Don't be afraid to mix and match your Simple Stories Collections! For my card, I used a metal balloon die in a manual die cutting machine (the Sizzix Big Shot) to die cut balloon shapes from the Birthday 3x4 Sn@p! cards. I also trimmed the greeting from one of the Birthday 3x4 Sn@p! cards. The balloons didn't take much paper from the Birthday 3x4 Sn@p! cards so I filed the scraps away to use on more die cutting projects! I hope that these ideas have inspired you to try using your 3x4 Sn@p! Cards in your die cutting machine(s)d. Thanks for hanging out with me today! Hi everyone, Marie here today to share a Life Documented project using the Homespun line! I love using scrapbooking products in new and versatile ways. When I first saw the Homespun collection I naturally thought of all things home such as cooking, sewing and gardening. But after looking through the papers, they also reminded me of a trip we took to a bavarian village in the mountains. Something about the potted flowers, weathered wood, and lace accents gave everything an old world feel which went perfectly with our travel destination. I used one of the typewriter charms on my journaling card, and a chipboard bicycle on another. An alpine layout wouldn't be complete without a man playing an Alphorn, right? I hope this helps to inspire you to look at your scrapbooking supplies in a new way. I had a lot of fun taking a collection made for "home" and using it on travel pages instead. I am using the 12x12 Faux Leather Album in teal for all of my Life Documented projects.